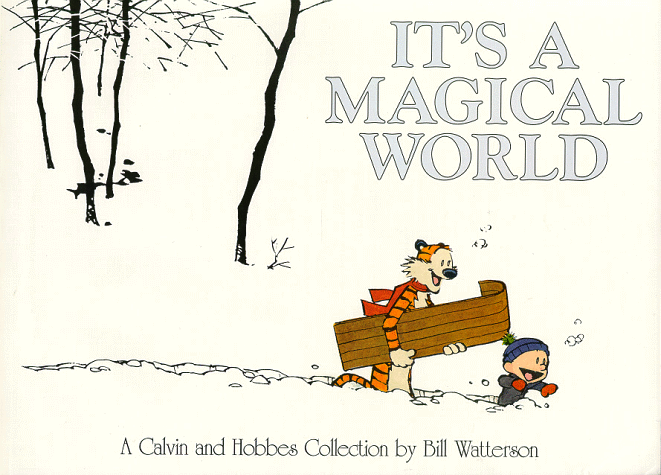 …It’s a Magical World: A Calvin and Hobbes Collection by Bill Waterson. Calvin and Hobbes is magical. This is a fact. The comic strip follows the adventures of its eponymous blond-haired bratty 6 year-old with the overactive imagination and his stuffed tiger who comes to life when no on else is looking (Or does he?). The comedy relies more on ideas and universal truths than on a punch line, and even the punch lines are character-based and integrate well with the surrounding story (however small it may be). When you laugh, you’re not just laughing at a joke, but at some part of your own life (or that of someone else’s you know) which has been revealed in a humorous light. You can relate to Calvin, Hobbes, or the key side characters. They are all three-dimensional, with lives that continue beyond the drawn panels, and you feel you get to know Calvin’s house, his school, the museums he visits, and even the godforsaken rocks his dad always takes them camping to. Some of the strips do have morals, but Waterson doesn’t scream them at you, or hide behind snarky quips. His environmental messages express sadness at the frequent failure of man’s stewardship over nature rather than angry finger-pointing or the more irrational wailings of many self-identified environmentalists. His strips about modern art are goofy and insightful, criticizing the false mentality behind those who think “True art is incomprehensible or obscure” while still not really attacking those artists themselves. He’s not interested in making enemies, but in encouraging healthier thoughts. And that is a very worthy goal. While to my knowledge Waterson is not a Christian, I usually find that his morals and sentiments are in line with my own. All this is helped by Waterson’s artwork. Has there ever been a weekly comic strip more beautifully drawn than Calvin and Hobbes? He doesn’t just draw talking heads at a counter (looking at you, Jim Davis! ), he draws the whole world. Different angles get utilized so we get to see different areas of Calvin’s house, yard, school, and nearby woods. There is a sense of spatial reality because you can understand how the characters are moving from one area to another, making it easier to relate Calvin’s experiences of those places to your own experiences. And then there are the Sunday strips, all in glorious full color! Here Waterson can go all out with shading and color, creating some truly gorgeous spreads. He draws a forest and makes it warm and wild, so that you can smell the woody dust in the air and feel the sunlight through the trees. He draws dinosaurs in Calvin’s comic fantasy sequences, and they are majestic. He draws the interstellar landscapes of Spaceman Spiff, Calvin’s greatest vehicle for escape from the mundane, and they evoke the lonesome wonder that the reaches of space can inspire in us even now as adults. Bill Waterson is not just a funnyman, he is an artist. And whenever I am sad, whenever I am tired, or distressed, or annoyed, or stretched to my limit, I need only open his book to read and my shoulders relax, and I sigh contentedly, and smile. This book actually stands in for the entire collection of Calvin and Hobbes books I have, since they all work the same effect on me. I chose It’s a Magical World because it contains some of the last strips drawn by Waterson, and the way he subtly acknowledges the fact that his strip is coming to an end, even while the lives of his characters continue, is so beautiful and poignant that it never fails to inspire me with hope. Merry Christmas, O my vast and wildly enthusiastic readership! On this Eve, and tomorrow, we celebrate the birth of Jesus Christ, who was and is the Savior sent of God to pay the redemption price for mankind’s sin. I hope you all can spend tomorrow with your closest family and friends, in love and joy together. My prayers and best wishes go out to you all. I had intended to have published a few Christmas reviews by now, but work and holiday preparations have interrupted the normal writing process. I still may get to them, but there’s no way they’ll get here by tomorrow. Sorry, folks! But, so you know, these are stories I have already finished, and hope to write reviews of within the next week or two. And yes, they are all fantasy. Calvin and Hobbes share Christmas with each other. EDIT 01-16-11: I’ve given up on reviewing A Christmas Carol (1951) and A Muppet Christmas Carol (1992) this year. At least one of them will be reviewed next Christmas, because I watch them each year.